Still no word on Morgan. God Bless Morgan and her family. How terrible to have somebody you love missing. The parents of missing Virginia Tech student Morgan Harrington plan to hold a news conference Wednesday afternoon in Charlottesville with Ed Smart, father of Elizabeth Smart. According to a news release from Dan and Gil Harrington’s PR firm, the news conference will address upcoming developments in the search for their daughter. A news release from Virginia State Police says the couple will also talk about a new search effort planned for this coming weekend. Morgan Harrington went missing more than two weeks ago at a Metallica concert in Charlottesville. It is scheduled for 1:00 p.m. I just cannot imagine what her parents are going through right now. Sounds like that fancy pr firm they hired is kicking in. With LE giving absolutely no information..interest is waning. They need to jump start if they want the publics help. If you have been following this story there was talk of a Facebook friend of Morgans. This is an article with pictures of him and his bus and home. Also a connection between the Harringtons and somebody he knows. Interesting. Isn't it strange that the body painted nurse happens to work at the same hospital as Mr Harrington. Coincidence? I don't know BJ. It is such a mystery. The real mystery to me is that nobody has said anything. No pictures, no friends, no enemies, no party goers. Its like a complete shutdown. I continue to follow this story. It has captured my attention so I thought I would update you. They had a massive search over the weekend led by this wonderful organization .http://www.lrcf.org/ . They had a very large turnout and covered a large area. Speculation runs rampant. Did she ever even attend the concert? How come no cell phone pictures of the group? Did she fall and hit herself and didn't know what she was doing. How come her friends didn't check on her when she said she was outside and "would look for a ride". Now the sightings are starting to come in. Somebody seeing a blonde in a Pantera shirt at the next Metallica concert and one seeing her at a 7/11 in Orange. No dates on the pictures. One picture in particular of a very thin Morgan in a red dress with her friends. But her poster picture shows a radiant, healthy Morgan. It would help so much if there was a picture released of the "real Morgan". As she looked concert night. The case of missing Virginia Tech student Morgan Harrington will soon get another round of nationwide coverage. The Dr. Phil show was at the Harrington’s Roanoke County home Monday, taping a show scheduled to air Thursday at 4pm. “I think it’s critical that we keep the story out there,“ Morgan’s father Dan Harrington said. The interview will air across the country to millions of viewers. The Harrington’s are hoping someone will hear the story and help. “It has a large audience, and we want to make sure we get Morgan’s story out,“ Dan Harrington said. Many of the questions Dr. Phil asks are the same questions the Harrington’s have faced day after day. Sitting in their living room, the Harrington’s say it is day 23 of the search, and interviews like this are as tough as ever. “I think maybe you’re not as excited as quaking in your boots, but you also have been doing this for three weeks and not sleeping for three weeks,“ Gil Harrington said. You can see in their eyes they are exhausted, but they refuse to stop. “You could never in your wildest dreams begin to imagine to find yourself in this place,“ Gil Harrington said. According to the Harrington’s, this place – in front of the camera – is where they need to be to get their daughter’s story in the spotlight until the questions about what happened are answered. BJ you are so quick. I just thought I should post the Dr. Phil show today and heck you have me beat by a country mile. Still no word on lovely Morgan. Gosh I wish they would find her and all the other missing in this world. I wake up in the morning with a happy heart and think of somebody like the Harringtons returning to their nightmare every single day. Interesting that I found this out today. We just talked about Gary, Indiana on the Miss CA topic page. I do not understand this case. Something is missing here. Why aren't any of her friends talking? OR, have they all talked to LE and LE is not talking? Isn't there a $100K reward? Jeanne and BJ, do you think she is still alive? This is interesting. I saw a post over on Morgans Facebook page and one of the posters provided a link to BrinkonCrime. I went there and this was posted. Wrapitup wrote: I do not understand this case. Something is missing here. Why aren't any of her friends talking? OR, have they all talked to LE and LE is not talking? Isn't there a $100K reward? Wrap I surely know. I think she is dead but I hope she is alive. But with nothing at all for almost a month ... it surely doesn't look good. Everything about this case is soooo hush hush. Even LE and Morgans parents disagree on the few things they publicly say. Such as if Morgans car was driven to the concert or another girl drove. LE is not talking at all. Just the initial statement and I think that was about it..maybe one other news conference. The friends are saying nothing. She has had nine best friends since grade school. She went to the concert with two of those friends plus/maybe a boyfriend of one of the friends..that two remains a mystery if it was a boyfriend of one of the two girls or a boyfriend of the other six. He has never been seen. One of the friends that went to the concert held a small press conference and that did not go well. She was smirky and added nothing. She is sisters with Morgans roommate and their dad is LE. hummm. Actually there is a $150,000 reward. $100,000 posted by the Morgans immediately and another $50,000 posted by Metallica the band they went to see. The money has brought in nothing. Everybody on the boards are beginning to squabble with one another and it mostly no frustration that nothing has been released and no Morgan. They did give a few clues to look for today...the first after this one month of blogging and worrying. Do you think maybe she was kidnapped and the parents have been contacted to pay a ransom and the police are keeping everything on the QT? Her parents have money. This is the only plausible explanation I can think of. Just a thought because they are rich. Maybe the police are asking them to act like it is NOT a kidnapping. I am just putting things out there. Stranger things have happened. The kidnapper could be saying, "Do NOT let the media know or I will kill her. Go on television pleading for her return." Either that, or I watch too much CSI!! State Police released new information in the search for missing Virginia Tech student Morgan Harrington on Friday. Investigators now believe Morgan was last seen hitchhiking on the University of Virginia Campus, the night of the Metallica concert, October 17th. Before Harrington disappeared, State Police now say witnesseses saw Morgan trying to catch a ride on the Copeley Road bridge around 9:30 p.m.
Also, State Police now add that Harrington was wearing a distinctive necklace. 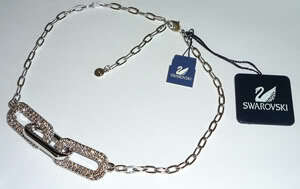 It is a Swarovski Crystal necklace made up of large crystal chain links, according to investigators. WOW!!! Is that THE necklace she was wearing or just a picture of one like hers? Why would she be hitchhiking? Wouldn't she have money for a cab and/or call her parent's? Was she messed up? So many questions? Personally, I think Le knows and has known since the beginning just what happened to Morgan. They knew it all in just a few days. Now they want to find her before they arrest somebody and they lawyer up and her family never has any closure. Just my humble opinion. May love and blessings pour on the Harrington Family as they live this nightmare. Poor you, Jeanne!! I know you are not feeling well and I am sorry to laugh out loud but your avatar is hilarious!!! I completely agree with your entire post!! This is so sad! Jeanne, your link goes to this girls profile. Who is she? What is Suspended players Facebook posting? Hi BJ just found this message. No this is not a girl. Jamil Tucker is one of the suspended basketball players. I found this on Facebook and thought you might like to see what he wrote. They are all abuzz over this. Kind of strange. The Harringtons were on The Today show today. I just found that out and if I can find a link to the video I will be back with it. After listening to it, I realized this was a few days before Halloween. I will say, Morgan's poor mom looks like she has not slept a wink! The search for missing Virginia Tech student Morgan Harrington now enters week five. Saturday morning her parents, Dan and Gil Harrington, spoke on NBC's Today Show. Gil Harrington stated, "None of this makes sense. It doesn't make sense that our daughter is missing - snatched from her life, abducted or possibly murdered." Gil Harrington said, “There are not thousands of them out there. It's unique like my daughter. We want her to come back home." Morgan's case has made national headlines and is also generating a lot of buzz on the Internet. Morgan's dad, Dan Harrington, is hopeful that buzz will turn into a credible lead. "The Internet and social networking - I think - has been effective in getting information out to a group of people that probably don't read newspapers or watch TV," he stated. Amid a new police report that the woman who disappeared during the October 17 Metallica concert was seen hitchhiking shortly before she vanished, various witnesses in and around John Paul Jones Arena say a young, blond woman was causing concern before they ever heard that the 20-year-old Morgan Harrington was missing. Among the several witnesses who reported seeing Morgan injured both inside and outside the Arena, one Metallica fan inside says she seemed “upset” with blood on her chin but declined his offer to help. Outside the Arena, another concertgoer says he was on the southeast side of the building waiting for late-arriving friends to meet him around 9pm when he heard a “commotion” at an entrance. “It seemed somewhat aggressive,” he says. Waiting for his friends and concerned that her behavior seemed “unusual,” he says, he declined and turned to walk away. The young woman responded, he says, by cursing at him and kicking him. “It wasn’t that hard,” he says of the kick, but it was disturbing enough that he immediately called his girlfriend to relate the encounter. “She told me I should call the police and report her,” he says. “Now I wish I had.” The concertgoer says he reported the encounter to police on Monday, October 18, when he learned of the disappearance. Minutes later, another witness says, a woman resembling Morgan was walking across the street with several companions. “It was right about 9pm when we were driving down Massie Road with JPJ to left,” says a Richmond bookkeeper/musician whose late arrival prevented her from seeing opening acts Gojira and Lamb of God— but got her there in time to spot a “wobbly” blonde woman step in front of the car. With the blonde were four young, white men— a conspicuous group, says the witness, because of the direction they were headed: away from the Arena. Until now, the missing woman’s boots have been described as “knee high,” but this witness insists they were “over the knee.” At presstime, neither police nor Morgan’s parents, Dan and Gil Harrington, had responded to the possible discrepancy. The men, says the witness, were allegedly laughing. The blonde, however, did not allegedly seem distressed and even, seemingly as a joke, shook one leg at the men, also clad in black. The witness estimates the time at 9:05pm since she placed a phone call to a friend a minute later while still on Massie Road. Police say the last confirmed sightings were on both sides of this bridge around 9:30pm. It wasn’t the last time the Richmond woman saw the young blonde. After she, her husband, and friend parked near U-Hall, she says, she saw the same group of five gathered around a vehicle just across Copeley Road from the RV Lot, or Lannigan Field overflow parking lot— one of the last places police have officially placed Morgan before she disappeared. “I figured, ‘They’re going to party before they go into JPJ,” says the woman, who estimates the RV Lot sighting as 9:15pm. When she learned about the disappearance on Monday, October 19, she says, she immediately relayed her information to police, who have interviewed her as many as five times in the past three weeks. Two weeks ago, police released a timeline that placed Morgan at various locations immediately outside the Arena from approximately 8:20pm until after she spoke to her friends by phone at 8:48pm. According to police, in that phone call, Morgan told her friends she was stuck outside the Arena (which , even with a ticket stub, does not allow reentry) and that she would find her own way home. Police have confirmed that a friend inside the concert had driven Morgan’s car and still had her keys. Those friends, her Blacksburg roommate Amy Melvin and JMU student Sarah Snead, have declined comment to media. A male who traveled to the concert with the three women from Harrisonburg has never been publicly identified, and police and the Harrington family have declined to name him. He is not, however, considered a suspect, says Virginia State Police spokesperson Corinne Geller. By 9:20pm, according to the police timeline, Morgan was spotted in the RV Lot, directly across Copeley Road from the U-Hall lot and adjacent to the UVA track. It’s also where Morgan’s purse and battery-less cell phone were found the morning of Sunday, October 18. According to several sources, members of UVA’s men’s basketball team were among the last to see Harrington in the grassy, tree-shrouded parking area before she was seen with her thumb out, hitching a ride on the bridge. Emails sent to numerous team members were forwarded to UVA spokesperson Carol Wood, who directed the inquiry to State Police, but Geller declines comment on the identity of any witnesses. “We leave it to them whether they want to speak publicly,” she says. One possible witness has been speaking publicly, in part, she says, because she doesn’t believe investigators have fully followed her lead. “I know what I saw,” says Norma Parson, a newspaper delivery woman who believes she saw Morgan– or an incredible lookalike— coming out of a room on UVA’s West Lawn at 3:45am October 18, six hours after the last confirmed sighting on Copeley Bridge. “She was tall and thin,” says Parson, who says the woman’s high black boots had heels making her appear taller than Morgan’s reported height of 5′6″ and that she wasn’t wearing the black hose or tights police have described. Because the woman also was wearing a jacket that was fastened shut, Parson says, she couldn’t determine whether the woman’s blonde hair, which was tucked inside, was long or short. But as the blond woman— accompanied by three young men, two shorter, one taller— passed by her in the well-lit brick walkway along the Lawn, she says, she got a clear look at her face, and her heavily made-up eyes, in particular. She says the woman’s presence in the wee hours of a chilly night— and her bare legs— seized her attention. “I thought, ‘What’s she doing out here dressed like that,’” Parson recalls. When she learned of Harrington’s disappearance two days later and saw heavy mascara- and eyeliner-wearing Morgan, “I knew immediately it was the same girl I saw,” says Parsons, who credits art training for teaching her to examine facial details— even those she sees in passing. “I never had a moment’s doubt,” she insists. Evidence experts, however, say that even the most earnest and certain witnesses can err. “It’s well established that confidence and accuracy are not clearly correlated,” says UCLA Law Professor Jennifer Mnookin, an evidence expert. Mnookin says that’s the reason police confirm every alleged sighting and look for multiple witnesses or surveillance tapes before releasing new reports. The female student who lives in the room Parson identified did not respond to repeated inquiries from a reporter, but a neighboring student says police interviewed him and his neighbors following Parson’s tip. “There is no blond girl who lives along this stretch,” says John Griffin, a Fourth Year engineering student, who lives next door, near Pavilion VII. Griffin says these rooms are among the quietest on the Lawn and that neither he nor the woman whose room the Morgan lookalike was allegedly seen exiting were home on concert night. In fact, he notes the Colonnade Club, which occupies Pavilion VII, was busy that night, and Griffin wonders if Parson may have simply seen wedding guests. “There were people from that party all up and down here that weekend,” he recalls. Parson says she remains frustrated that police have not allowed her to identify the men she saw with the woman— particularly because she saw one on a subsequent night on the Lawn. “I just want them to let me identify who I saw,” says Parsons, who now fears that her status as a potential witness may have put her in danger as she makes her middle-of-the-night newspaper rounds. But law expert Mnookin points out that police are limited when it comes to identifying people who haven’t committed a crime. “You can’t arrest someone for no reason, and can’t make someone be in a line-up,” she says. If there were an already existing photo or if Parson could point one out in a public place, police could question him. Parson acknowledges there’s a possibility the woman she saw wasn’t Morgan, but without knowing who it was— or who the men with that woman are— she says, there’s no way to rule it out. Two doors down from the room Parson identified, Fourth Year Declan Tansey says he was not interviewed by police and hadn’t heard anything about the case except what he’s read in news accounts. He, however, agrees with Griffin’s assessment that his room and the rooms around it are not the “party rooms” on the Lawn. According to police spokesperson Corinne Geller, police have “thoroughly vetted” Parson’s lead but have not found anything connecting it to Morgan’s disappearance. And Parson’s is far from the only lead police are following. They have received approximately 400 tips, Geller says, many of them reports of Morgan sightings after the official timeline ends; but so far, none have been confirmed. Among several leads police haven’t been able to rule out at this time, says Geller, is a possible sighting of Morgan around 10am on Sunday morning, October 18, at the Sheetz gas station in Orange. An online poster using the name Karen55 on blogs dedicated to Morgan’s disappearance describes seeing a slightly disheveled young woman with long blond hair, dressed in all black, exiting the store and then standing outside the store near a trash can. Notably, she says online, the young woman’s t-shirt bore the name of the band Pantera— she noticed, she wrote, because her daughter wanted a Pantech Matrix phone and she initially looked closer to see if those were the words. Reached by phone, Karen55 requested that her full name not be used and says she remains “haunted” by the sight. “I don’t know if it was Morgan,” she says, “but I know she fit the description.” She says the word Pantera was spelled plainly across the black t-shirt and that there were no images accompanying the letters. A Sheetz manager confirms police reviewed all surveillance at the store and spokesperson Geller says that police dispatched an agent the same day they got that tip. While there was no sign of Morgan on the video police reviewed, Gellar admits they can’t rule it out and are waiting for further information that would confirm that sighting or any others that seem plausible. I think Morgan MAY have been on extacy. MOO! Ground zero in this case appears to now be the RV parking lot that the athletes park their autos in when there is a concert. That is where they found Morgans cell phone minus the battery. They also say she was there talking to three athletes. A red herring was thrown out about her hitchhiking on the bridge but surely they would be able to view cameras from that area. Funny how no FBI reports, no searches planned..just the quiet like before a storm. I think the FBI is keeping this very, very close to the vest. I think there is a lot more they are not releasing to the media. How are you feeling, jeanne? Been thinking of you! There has been much confusion about another girl that goes by the name of Dee and is referred to as DS. She is a blonde also dressed in the black skirt, Pantera shirt and boots..but no stockings. She was wearing a jacket and I think Morgan left her jacket in the car. There was a tape of her at the concert where she had gone with her boyfriend and two of his friends. Everybody thought for sure it was Morgan until DS came forward and said "it was me". So there we have two blonds..looking alike. Then there was a blonde Road Manager for Metallica videotaped in the doorway at the venue. She too blonde, wearing the black outfit and even a necklace similiar to the one Morgan was wearing that evening. We now know she is a Road Manager for Metallica. Nothing is coming out of LE or the friends. Personally I think they have their guy (s). I think before they arrest him (them) they are hoping to find Morgan and bring her home to her parents. Once they lawyer up..well we know the answer to that. JVM is talking about this case right now LIVE!! So glad, Jeanne. Sleuthing will do that to you!!!!!!!! glad you are much improved, Nancy Drew. i mean Jeanne. Check out what Blink on Crime has to say about the Morgan Harrington case. Hope this is not Morgan. They say the clothes are not the same as what she was wearing but who the heck knows what she wore..she made two or three stops after checking clothes with mom..the night of the concert. Virginia State Police investigators have collected DNA samples from Morgan Harrington's parents. The Virginia Tech student disappeared in Charlottesville 53 days ago. On the website dedicated to finding Morgan, Harrington's mother Gil says that the samples were collected just after Thanksgiving. Why would they collect DNA from the parents? What the hell is going on? They haven't discussed that too much. They mostly think the DNA samples are because there are soooo many dead bodies showing up...sigh...they can do a computer match instantly. At least that is my take on it. I have been posting on the FindMorgan.com website set up by her parents PR guy. It is run by a nice fellow named Bobby. Most of the posters over there are very nice and give good theorys if anybody is interested. Mrs. Harrington writes a note every few days under the family blog and Mr. Harrington will post now and then. I am stunned by the silence in this case. No family, no friends, no LE. Its been two months and nary a word from any key players. How can they shut this whole group up. Even the local paper The Hook and their two really good feature writers have nothing to say or write. A PI guy named Bulldog published some private pictures from Alex the brothers facebook account and the crowd about crucified him. They even shut down Webslueths because the group over there went bananas. They removed everything. Actually I saw the pictures and they were of a young girl living her life. No exposee of anything else. So if you have any questions, fire away and I will try to answer then. What a wonderful website. Thank you so much for posting it here. Morgan is so beautiful and she had no reason to just take off. I suspect foul play. I am posting the reward the family is offering for information on our home page. Those pics of her tear at my heart. Thanks for posting this website, Jeanne!! I do so little here and your 's are always so big. I am humbled by your kindness. Morgan is still missing and the blogs just go round and round with no information and the same old speculation for over two months now. So Ann Flaherty is writing articles and everybody is excited to see what she will uncover. Hopefully...something. Her second article is due out tomorrow at this same website. The next in the series will focus on the leads, sightings, etc. If you have any new information, leads, etc. that you would like me to highlight, please email me privately. I hope my series will keep this story on the minds of those travelling this holiday season and that they will come forward with any information that might help bring Morgan home. From the beginning everybody blogging has believed that LE has kept everybody quiet about Morgan and that night. The friends of Morgan have taken a real beating over everything that happened the night of October 17, 2009. Now a friend of one of Morgans friends posted this. So now we know that Morgans parents the Harringtons are responsible for this Wall of Silence. I think that terrible. They look like saints while the friends look like low lives. How will this end..who knows. Just thought I would post to keep everybody interested up to date. Written by Morgans friends, friend in answer to the question "why aren't Morgans friends talking"
'Some people have asked those same questions before. I've talked to some of Morgan's friends and at first I thought the LE was asking them to stay quiet. However, one told me that the Harrington's have asked them not to talk to people. For what reason, I'm not sure. But the girls kind of ask the harringtons before they really talk to anyone official about the investigation. it's not necessarily that the friends don't want to talk. Lt. Radar held a news conference today. Nothing new. Just that they are following up leads. Confirmed Morgan had been drinking, friends not involved in disappearance. MOrgan was last seen on the Copley bridge. She either hitchhiked or put her hand out to wave whomever she was waiting for. They are following leads. There should be a video soon and I will post it when it comes out. Its almost like that girl vanished from this earth with thousands of people attending concerts, ballgames and family weekends at the university. Amazing. How did they confirm she was drinking? This is just horrible!! More than two months after the disappearance of VT student Morgan Harrington, Virginia State Police said in a press conference this afternoon that Harrington was drinking and not acting normally on the evening when she was last seen. According to a statement from police, based on eyewitness accounts, Lt. Joe Rader said that Harrington was drinking on October 17, the night she disappeared at a Metallica concert outside John Paul Jones Arena. "Those accounts also describe her behavior as irrational, in a way that would have been very unusual for Morgan," reads the statement. Furthermore, state police say it is unknown whether Harrington had been drugged or injured. The statement also says that investigators are looking for a red digital camera, possibly Kodak or Sony, that Harrington had with her the night of her disappearance.